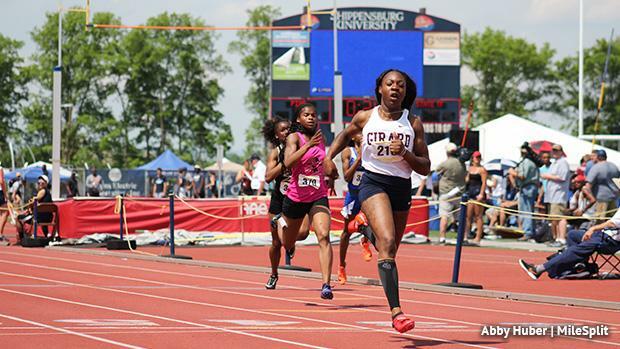 Thelma Davies of Girard College is going after her fourth straight PIAA double in the 100 and 200 in Class AA. The second half of Davies' bid for the historic double at states will come in the 200 meters, where she'll be heavily favored. Davies will be chasing the clock this spring, mostly. She ran 23.10 at USATF Juniors last summer, a state record. Davies is coming off her best indoor season in the 200 meters that saw her break the state record by going 23.51 at indoor states. That should bode well moving forward. She'll be looking to join an elite class of high schoolers that have dipped under 23 seconds in the event. A talented crop of sprinters come after Davies. Talitha Diggs of Saucon Valley is the likely AAA favorite this spring. During the indoor season, she was second to Davies at states and then went 24.16 at indoor states. She went 23.90 at outdoor nationals last spring and shows she just keeps getting better and better. Warwick's Leah Graybill (fourth), Upper Saint Clair's Jane Madson (fifth), and Abington's Rorie Spencer (sixth) are the other returning AAA medalists from last season. During indoors, Coatesville's Arianna Eberly was fourth at states (and she went 24.34 during the summer in AAU). Graybill was fifth and Madson was sixth at indoor states. After Davies in AA, there are five other returning medalists. Neumann Goretti's Mykala Perry ran 24.94 last spring to take second at outdoor states. The junior will be a factor this spring again. Mastery - Shoemaker's Marlina Voker, Palisades' Lydia Bottelier, South Park's Maddie Raymond, and Swenson's Jada Smith. There's a ton of talent coming out of the independent schools this spring, led by a pair of freshmen that dazzled during the indoor season. Moforehan Abinusawa of Germantown Academy went 23.56 at AAU Nats last summer. She went 24.35 during the indoor season and should be primed for a big first outdoor HS season. Sanaa Hebron of George School will also be a factor. She was seventh at indoor states and ran a 24.73 best. Others to watch include Cheltenham's Bria Barnes, Warwick's Lily Palacio-Lewis, and Coatesville's Porsha Miles. Check out the top 1000 returners in the 200 meters for this outdoor season and watch an interview with Davies from after states last year.